"I promised my mother to improve the situation of women in Libya," he said at the time. His mother, a Bedouin tribeswoman born when Libya was an Italian colony, was unable to read or write. 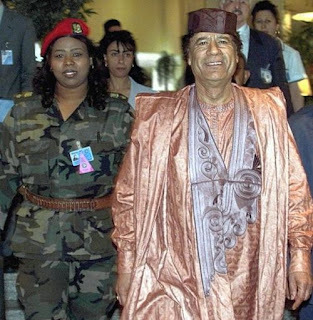 Muammar Gaddafi was known internationally for his beautiful Amazon virgin body guards. They were more than just pretty ornaments, they were there to protect his life if need be and it is said at least one took a bullet for him over the years. The man did a great deal to improve women's rights and situation in Libya, actions that no doubt raised the ire of the more traditional Muslim leaders, especially those of the Wahhabi persuasion or of the Muslim Brotherhood. Women were armed and taught to shoot to protect Libya at the beginning of the invasion to protect themselves, their homes and families. Leaders who maintain personal healthy relationships with the women in their immediately life also tend to want to help women in general achieve their full potential. The Leader was one of those men. Throughout most of his life, Qaddafi was a handsome, intelligent, dare I say it, sexual man, who truely enjoyed women. Why wouldn't he want to help them? Besides, he was a good son and good sons are usually good to women in general. One of the first changes in the new Libya is the return of Sharia Law with the intent of returning polygamy to the country and the removal of most women's rights, potentially putting Libya's women into a position as backwards as was imposed upon Afghan women or those of Iraq. Certainly the fate of Qaddafi's Amazons as pictured below is a sober reminder to the world of just what evil creatures now hold power in Libya. 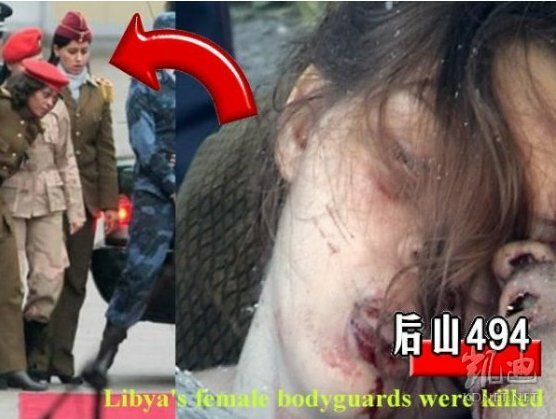 that Libyan leader Colonel Muammar Gaddafi took good care of women. Not only did he support them, he also believed in their abilities and emancipation, moreover in a society where being a woman is not always fully appreciated. For example, Gaddafi highlighted his female bodyguards as a symbol of his belief in women's emancipation and their role in the defence of their country. Central to the Al Fateh revolution was the empowerment of women. The Jamahiriya government made efforts to advance female emancipation. It encouraged women to participate in Libya's political life and several cabinet posts were allocated to them. Women were also able to form associations. Bouseyfi Kulthum, Libya's first female pilot told that Gaddafi changed the social taboo that closed the space for women. Under Jamahiriya government women also made great strides in employment, with improved access to education and acceptance of female paid employment. In 1970, a series of laws regulating female employment were passed, including equal pay for equal work. By 2006, employment for Libyan women was estimated at 27%, a relatively high percentage for an Arab nation. Working mothers enjoyed a range of benefits designed to encourage them to continue working even after marriage and childbirth, including cash bonuses for the first child and free day care centres. A woman could retire at the age of 55, and she was entitled to a pension. Gaddafi treated black women as well as he did any other. His was not a racist regime as has been claimed by enemies. During the last decade of King Idris’ rule, females enrolled in primary education were only between 11-19%. However, in 1969, education was made a right. And by 1990, the figure stood at 48%. Women's enrollment in higher education stood at 8% in 1966, but reached 43% by 1996, equal to that of males. Under Jamahiriya government child marriages were banned and the minimum legal age to marry placed at 18. Since 1973, Libyan women have had equal rights in obtaining a divorce. There were also gender-friendly women's laws passed on marriage and divorce. Gaddafi established the Tripoli Women's Military Academy in 1979 to advance women's emancipation. The female soldiers passed through this academy. "Without the leader, women in Libya would be nothing," Fatia, a 27-year-old bodyguard trainee in Tripoli, once told a researcher. I am ready to die for him. He is a father, a brother and a friend to whom you can confide. You have no idea how humble he is." • Women are never confined to their homes while their husbands, fathers and brothers go to work. Gaddafi forbade restricting women's mobility. • Women have full rights to drive cars (unlike their sisters in Saudi Arabia). Women also keep their passports. In several Arab countries, a woman’s husband holds her passport so she cannot travel outside of the country without his permission. • No person can force a Libyan woman to marry any man. • The Imams are expected to protect the woman from abuse by relatives. • A Libyan woman can leave a marriage any time she chooses. • If a woman enters a marriage with her own assets and the marriage ends, her husband cannot touch her assets. The same is true of the man's assets. There is no difference in human rights between man and woman, the child and the adult. It follows as a self-evident fact that woman and man are equal as human beings. Discrimination between man and woman is a flagrant act of oppression without any justification. There is no difference between man and woman in all that concerns humanity. The woman is the owner of the house because it is one of the suitable and necessary conditions for a woman who menstruates, conceives, and cares for her children. All societies nowadays look upon woman as no more than an article of merchandise. The East regards her as a commodity for buying and selling, while the West does not recognize her femininity. 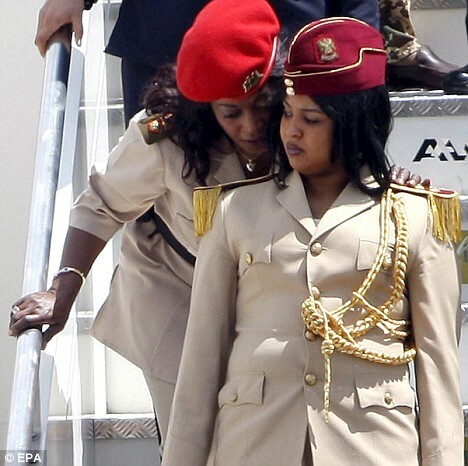 ED: When Gaddafi fled, his female bodyguards ["The Revolutionary Nuns" or "Amazonian Guard"] also disbanded, but still many of them were tracked down. According to information organized by a Middle Eastern website, the first fled with her boyfriend but was caught by the opposition and shot dead, the two of them dying together. 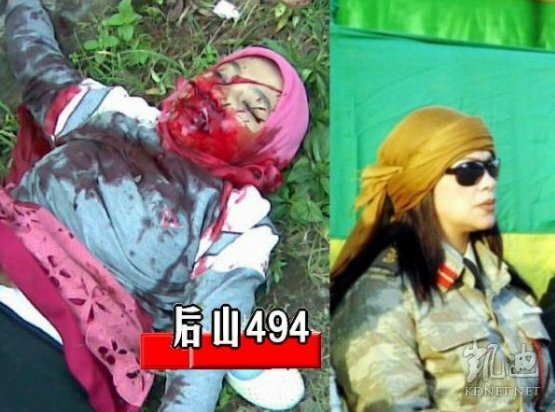 The second was identified despite her makeup/disguise and was beaten to death. The third was kidnapped by the opposition’s soldiers, viciously tortured and gang-raped for days before being strangled to death with the words “the fate for Gaddafi’s whores” beside her, her body rotting when discovered. Now of course the western presstitutes will shout how the women of Libya and Africa overall have been liberated and the reality is just the opposite, they will be subject to an invention of "sharia law" that actually has nothing to do with Islam and is in reality only Zionist racism and oppression of women hiding beneath a veil of western "liberation" of "oppressed" nations THAT NEVER ASKED ANYONE TO "liberate" them. Merci, Noor, pour votre écriture. Palestine Cry: The Truth from a priest from his own writings: Catholics and Muslims worship the same true God.